The sunken 2900’ stretch of the 101 freeway and the surrounding neighborhood in the heart of downtown Los Angeles between Los Angeles Street and Grand Avenue provide the parameters for this new landscape for urban regeneration; opportunities to transform wastelands into connective and multi-functional green open space. Once a severed site of disparate scales, uses, and communities, this part roofscape/groundscape repairs this urban scar and repurposes the existing airspace above the freeway with multiple uses. A connective tissue is grafted which allows for regenerative processes to occur through operative actions such as nourishing, restoring, rejuvenating, weaving, filtering, breathing, buffering, harvesting, observing, networking, and interacting. Through the juxtaposition of non-hierarchical bands of disparate performative programs and a network of weaving pathways which induce happenstance occurrences, this urban scar is repaired and our conception of Park is confronted. Through a single surface a connective topography takes form and begins to emerge, delicately hovering over the freeway airspace interfacing at precise moments of pedestrian connection, modulating between the airspace of the freeway and that of the public realm. 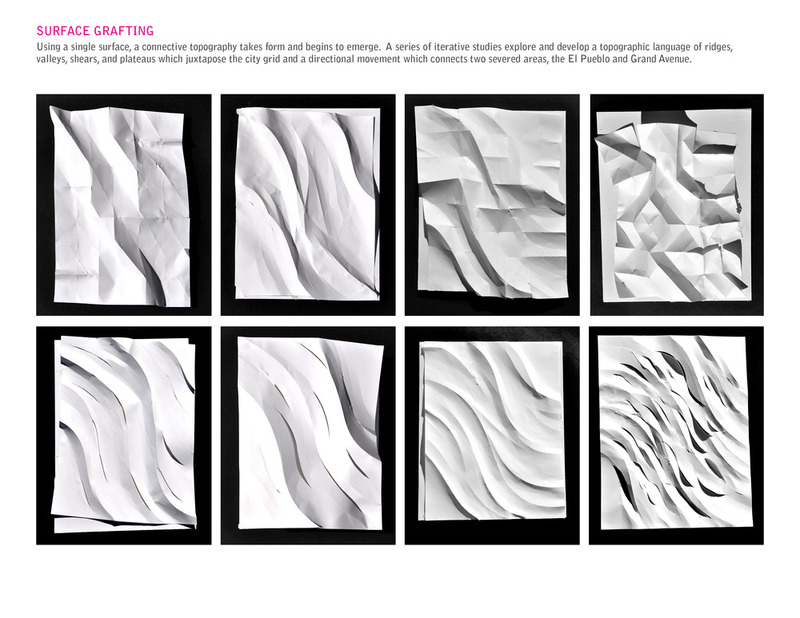 A series of iterative studies explore and develop a topographic language of ridges, valleys, shears, and plateaus which juxtapose the city grid and a directional movement that connects the two severed areas divided by the freeway, the birth place of Los Angeles the El Pueblo village and the contemporary heart of the city Grand Avenue. 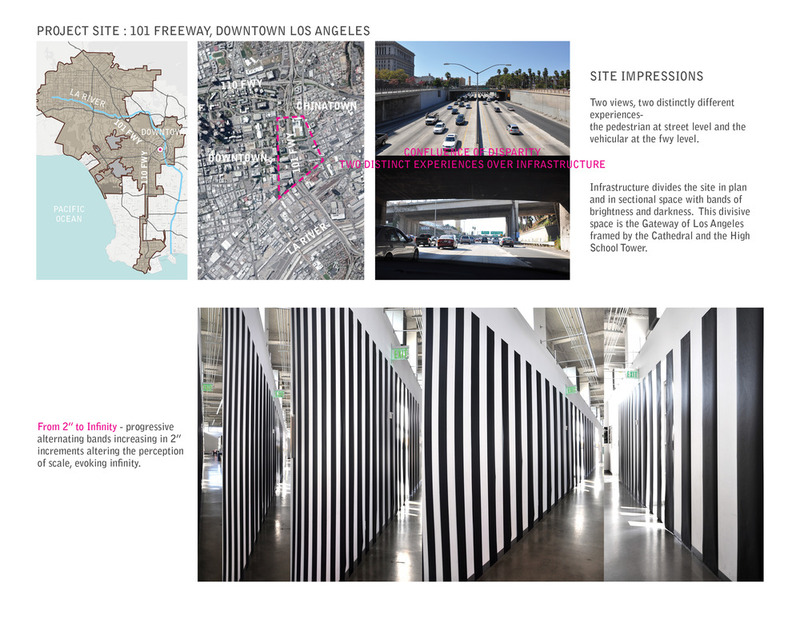 The formal language explores issues of spatial connectivity through the site as well as the visual connectivity above and beneath the freeway, as well as issues of freeway noise and pollution mitigation, severe grade changes, and the specific focus on certain view corridors through the site. Valleys and ridges are shaped and graded to become water sinks allowing for water harvesting and eventual aquifer recharge. The undulating park edge and surface perforations further a dialogue of spectator/spectacle between infrastructure and the parkscape as well as allowing car exhaust, natural light and air through. As one traverses through and under the ground/roofscape, these openings offer glimpses of park, city, and freeway revealing the tenuous nature of our connection to nature and the contradictions of a city. 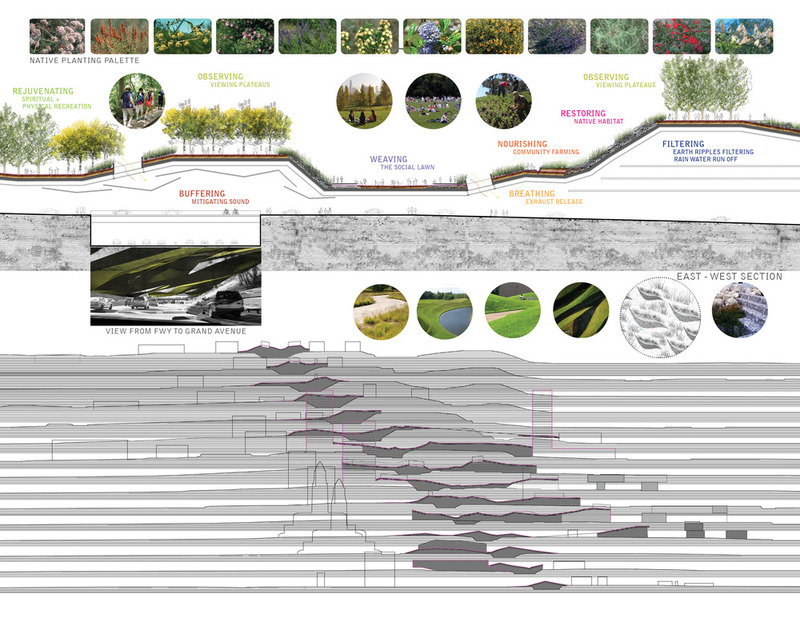 Non-hierarchical bands represent various social programs needed in urban cities for spiritual, educational, and physical rejuvenation as well as productive and performative functions; native habitats, community farming which supports the local neighborhood, and a series of earth ripples/gabion walls which permit rain water to be absorbed, filtered, and then harvested into storage tanks. A single band is programmed as the Social Lawn, an open clearing with a gently bowled shape, for unscheduled interactions and group gatherings. It is partially framed by a series of plateaus which begin to define it spatially, continuing a dialogue of spectator/spectacle. It is an intimate space meant for contemplation, a place to reflect one’s position with the environment and city beyond. Groves of native trees weave along the criss crossing pathways which inscribe the undulating ridges, valleys, concave and convex spaces. Through the juxtaposition of disparate programmed bands and the underlying ecological processes, our consciousness and role of city infrastructure is elevated.